Mutagen Ooze is the mysterious goo that turned the Green Team from pet turtles into the heroes in a half shell they are today. The Ooze also created their many mutant friends and foes. Handle with care! This Ooze cannister contains Ooze and a bonusmini Turtle, collect all 4! This toy costs approximately £5.99 (for the latest and best prices make sure you check our retailer list for the Turtles Mutagen Ooze with mini Turtle Figure above). 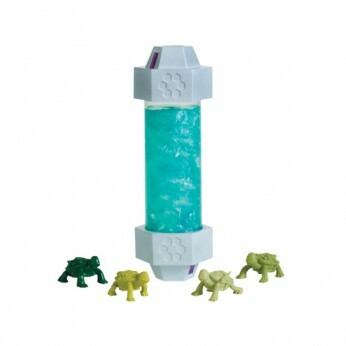 In our review of Turtles Mutagen Ooze with mini Turtle Figure we classed it as being suitable for ages 4 years, 5 years, 6 years, 7 years, 8 years but recommend you check the manufacturer specific advice before purchasing.